Editorial Note: The following news reports are summaries from original sources. They may also include corrections of Arabic names and political terminology. Comments are in parentheses. The Israeli military attacks since the early morning hours of today have claimed the lives of 16 Palestinian civilians as the death toll keeps climbing and changing. The death of more civilians in fresh Israeli air raids today increased the death toll to 90 Palestinians, mostly civilians. Two related citizens called Abdullah and Mahmoud Abu Khater have been killed in an Israeli artillery attack on Ma'an area east of Khan Younis district. An Israeli raid north of Khan Younis also claimed the lives of two related men named Anwar and Ibrahim Al-Astal and led to the injury of one of their children. A civilian car boarded by three Palestinians from the same family was also bombed in the same district. Their bodies were taken to the hospital charred and torn apart. A report previously published this morning by the Palestinian information center (PIC) had said that five Palestinians including two children and two women were killed in different air raids on Azzeitoun neighborhood to the east of Gaza. Other civilians were reported to be killed in air raids that happened earlier on Monday. As for the occupied Palestinian territories, different Israeli reports claimed that seven Israeli settlers have been killed and 187 others have suffered injuries since the Palestinian resistance retaliated to Israel's military escalation. The rocket attacks on Israeli targets also inflicted heavy material damage on several homes, hotels, cars and commercial structures and led to military losses after the resistance was able to target, warplanes, warships and armored vehicles, according to the Israeli media. Four Palestinians were martyred on Sunday in Rafah in the southern Gaza Strip due to the bombing of a car and a house, along with a number of wounded. The Israeli aircrafts targeted a civilian vehicle driving near Al-Abadla gas station, north of Rafah, killing three Palestinians, and seriously wounding a forth resident, PIC reporter confirmed. Local sources reported that the army bombarded a home that belongs to Mahmoud Al-Hash-Shash, in Rafah, leading to the death of Sabha Mhawesh Al-Hashash, 60, three members of her family suffered moderate injuries and were moved to Abu Yousef An-Najjar Hospital in the city. Late on Sunday at night, two Palestinians, including a child, were injured when the army fired missiles into a home, belongs to Mohamed al-Hashash east of Gaza city. Local residents expected that there were other victims in addition to Sabha al-Hashash trapped under the rubble of the house where the rescue teams are still searching for other victims. At least 76 Palestinians have been killed and more than 680 have been injured since the Israeli assaults on Gaza started on Wednesday November 14. A 20-months old toddler on Sunday evening died of serious burns he sustained after the fall of a tear gas grenade fired by Israeli troops into the house of his family in Qalandiya refugee camp near occupied Jerusalem. Local sources said the Israeli troops fired tear gas grenades during confrontations that took place in the camp and near its checkpoint in protest at Israel's military aggression against the Gaza people. A medical source also said that the slain child was a 20-month old toddler named Najeeb Ahmed Najeeb. The source added that the doctors in Palestine hospital tried their best to save the child of serious burns he suffered when an Israeli tear gas canister fell into the house burning the matters he was sleeping on. In an earlier incident, a 13-year old child also sustained serious injuries when an Israeli soldier fired live ammunition at him during a protest supporting Gaza in Bab Al-Zawiya in Al-Khalil city. A medical source in the city hospital said the child, Ibrahim Abu Eisha, suffered serious fractures in his skull. The early hours of Monday morning have seen the death and injury of more Palestinian civilians in Israeli aerial attacks on the Gaza Strip bringing the death toll to 83 victims. The number of the Palestinians wounded has also risen to 710 this morning in Israeli deadly air raids on civilian populated areas in Gaza. At about 06:15 am in Gaza, a little girl named Rama Ashendi was killed after the house of her family was bombed in Azzeitoun neighborhood east of Gaza. Four other civilians including a child, two women and a young man were killed and more than 35 others, mostly children, were wounded in an Israeli air raid on their house in the same neighborhood. Seven of these children, from the family of Azzam, sustained serious injuries. A civilian working as a vegetable vendor named Abdulrahman Attar was also killed in an Israeli aerial attack on Salatin area north of Gaza. In this regard, member of Hamas's political bureau Ezzat Al-Resheq said that Egypt in cooperation with some Islamic and Arab countries are making efforts to broker a truce ending Israel's military aggression against Gaza. Resheq told Quds Press on Sunday that any truce with the Israeli occupation regime should be in accordance with the terms set by the Palestinian resistance in Gaza in order to ensure an end to the spate of assassinations and the economic blockade. The Hamas official also said that the Israeli regime suffer from a crippling military and political crisis after the Israeli premier Benjamin Netanyahu discovered that his war was not a picnic or a short stroll as he had thought. He added that Netanyahu thought his war would raise his popularity and thus his chances of winning the elections, but his political future has become at stake because of the surprising and strong resistance response. Palestinian medical sources reported that five residents were killed in a new Israelis attacks targeting different parts of the Gaza Strip. 19 Palestinians have been killed since Monday at dawn, 54 injured; 92 Palestinians have been killed by Israeli shells since Wednesday, more than 740 were injured. Medical sources reported that The two slain residents were identified as Ibrahim Mohammad Al-Astal, 46, and Omar Mahmoud Al-Astal, 14, a 4-year-old child was injured. Two more residents identified as Mahmoud Sa’id Abu Khater, and Abdullah Harb Abu Khater, were killed in Khan Younis, in southern Gaza, after the army fired a missile at a motorcycle; the motorcycle drivers escaped unharmed but the two residents, walking nearby, were killed. Another resident was killed and his body was severely mutilated and burnt when the army bombarded Tal Al-Hawa, south of Gaza city. The resident was identified as Mohammad Shamlakh, 32. Earlier on Monday at dawn, three Palestinians were killed when the army fired a missile at a vehicle west of Dair El-Bala'h, in central Gaza. Also, residents Anwar Al-Astal and Ibrahim Al-Astal were killed on Monday morning when the army bombarded an area west of Khan Younis. One child girl, the daughter of one of the slain residents was seriously injured. The army also fired a missile at a civilian vehicle transporting three brothers who were killed in the blast and their bodies were severely mutilated. The victims were identified as Amin Abu Bashir, Salah Abu Bashir, and Tamer Abu Bashir. 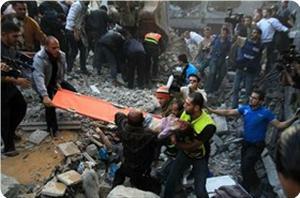 At least 14 Palestinians, including several children and family members, were killed by Israeli missiles and shells. The number of Palestinians killed due to the ongoing Israeli aggression since last Wednesday arrived to 89, mainly civilians including children, infants, women and elderly, while more than 720 Palestinians have been injured. 1- Ahmad Al-Ja’bary, 52 years old. 2- Mohammed Al-Hamss, 28 years old. 3- Rinan Arafat, 7 years old. 4- Omar Al-Mashharawi, 11 months old. 5- Essam Abu-Alma’za, 20 years old. 6- Mohammed Al-qaseer, 20 years old. 7- Heba Al-Mashharawi, six-month pregnant, 19 years old. 8- Mahmoud Abu Sawawin, 65 years old. 9- Habis Hassan Mismih, 29 years old. 10- Wael Haidar Al-Ghalban, 31 years old. 11- Hehsam Mohammed Al-Ghalban, 31. 12- Rani Hammad, 29 years old. 13- Khaled Abu Nasser, 27 year old. 14- Marwan Abu Al-Qumsan, 52 years old. 15- Walid Al-Abalda, 2 years old. 16- Hanin Tafesh, 10 months old. 17- Oday Jamal Nasser, 16 years old. 18- Fares Al-Basyouni, 11 years old. 19- Mohammed Sa’d Allah, 4 years old. 20- Ayman Abu Warda, 22 years old. 21- Tahrir Suliman, 20 years old. 22- Ismael Qandil, 24 years old. 23- Younis Kamal Tafesh, 55 years old. 24- Mohammed Talal Suliman, 28 years old. 25- Amjad Mohammed Abu-Jalal, 32 years old. 26- Ziad Farhan Abu-Jalal, 23 years old. 27- Ayman Mohammed Abu Jalal, 44 years old. 28- Hassan Salem Al-Heemla’, 27 years old. 29- Khaled Khalil Al-Shaer, 24 years old. 30- Ayman Rafeeq Saleem, 26 years old. 31- Ahmad Abu Musamih, 32 years old. 32- Osama Mousa Abdeljawad, 27. 33- Ashraf Hasan Darwish, 22. 34- Ali Abdul-Hakim Al-Mana’ma, 20. 35`- Mukhlis Mahmoud Edwan, 30. 36- Mohammed Al-Loulhy, 24 years old. 37- Ahmad Osama Al-Atrash, 22. 38- Abdul-Rahman Salem Al-Masri, 31. 39- Awad Hamdi Al-Nahhal, 23. 40- Ali Hassan Iseed, 25 years old. 41- Mohammed Sabry Al’weedat, 25 years old. 42- Osama Yousif Al-Qadi, 26 years old. 43- Ahmad Ben Saeed, 42 years old. 44- Hani Bre’m, 31 years old. 45- Samaher Qdeih, 28 years old. 46- Tamer Al-Hamry, 26 years old. 47- Jumana Salamah Abu Sufian, 1 year old. 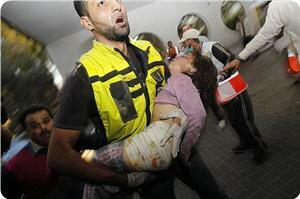 48- Tamer Salamah Abu Sufian, 3 years old. 50- Eyad Abu Khusa, 18 months old. 51- Tasneem Zuheir Al-Nahhal, 13 years old. 52- Ahmad Essam Al-Nahhal, 25 years old. 53- Nawal Abdul-'Al, 52 years old. 54- Mohammed Jamal Al-Dalou, the father. 55- Ranin Mohammed Jamal Al-Dalou, 5 years old. 56- Jamal Mohammed Jamal Al-Dalou, 7 year old. 57- Yousef Mohammed Jamal Al-Dalou, 10 years old. 58- Ibrahim Mohammed Jamal Al-Dalou, 11 months. 59- Jamal Al-Dalou, the grandfather. 60- Sulafa Al Dalou, 46 years old. 61- Samah Al-Dalou, 25 years old. 62- Tahani Al-Dalou, 50 years old. 63- Amina Matar Al-Mzanner, 83 years old. 64- Abdullah Mohammed Al-Mzanner, 23. 66- Mo’men Soheil Hamada, child. 67- Atiyya Mubarak, in his fifties. 68- Hussam Hussein Abu Shaweesh, 37. 69- Samy Al-Ghfeir, 22 years old. 70- Mohammed Bakr Al-Of, 24 years old. 72- Nabil Ahmad Abu Amra. 73- Hussein Jalal Nasser, 8 years old. 75- Sabha Al-Hashash, 60 years old. 78- Emad Abu Hamda, 30 years old. 80- Mohammed Iyad Abu Zour, 4 years old. 81- Nisma Abu Zour, 19 years old. 82- Ahed Al-Qattaty, 38 years old. 83- Al-Abd Mohammed Al-Attar, 51. 84- Rana Ash-Shandi, 18 months. 85. Tamer Roshi Basheer, 30. 86. Amin Zohdi Basheer, 40. 88. Ibrahim Mohammad Al-Astal, 46. 89. Omar Mahmoud Al-Astal, 14. 90. Mahmoud Sa’id Abu Khater. 91. Abdullah Harb Abu Khater.